Posted by Dustin Miller on April 25, 2013. 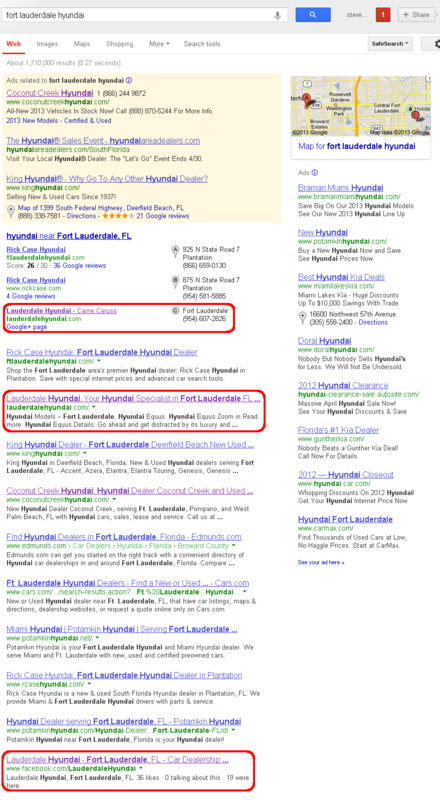 As you can see, Lauderdale Hyundai appears in local results along with the Google+ page, again in the organic search results and the Facebook page is listed at the bottom of the first page. Local, organic and social rankings on the first page of Google expose your business to a large audience of your target customers, drastically increasing potential sales and customer base. We selected several relevant keywords for which we wanted Lauderdale Hyundai to rank. These include phrases like “new Hyundais for sale in Fort Lauderdale,” “used Hyundais for sale in Fort Lauderdale,” all of the most popular Hyundai models and more. After creating the highly optimized website, http://lauderdalehyundai.com/, it quickly climbed in the search rankings organically. PPC Professionals can help build an extensive web presence for your business and use search engines to drive visitors to your site who are searching for the products or services you offer. Want to learn more? Email us today at sales@ppcprofessionals.com or call us at (954) 606-5359.